SEASON: The 2018 season at Papa’s Pumpkin Patch is Sunday, Sept. 9 – Saturday, Oct. 20. We haul pumpkins and all of our other produce like squash, gourds, straw bales, corn stalks and decorative corn into the yards each week in September and early October so you always see a fresh supply of fall color. 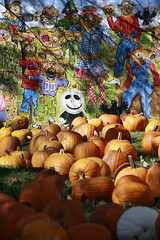 HOURS: Papa’s Pumpkin Patch is open 12-7 pm daily, weather permitting. Always double check the home page of Papa’s website or Papa’s Facebook fan page if you’re uncertain about the weather or our hours. We try to post our intentions for each questionable day by 11 am. If we need to close the patch during the day, we will post our closing on the website and Facebook page as soon as we make the decision. Mother Nature in North Dakota can be challenging sometimes! 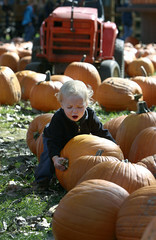 COSTS: General admission at Papa’s Pumpkin Patch is $5/person. Infants and toddlers age two or younger are free. If you are visiting Papa’s Pumpkin Patch on Monday through Friday (from 9 am – 3 pm) as part of a pre-scheduled group or party, the cost is $1/person. Thursdays are Dollar Day at Papa’s: Admission on Thursdays is only $1/person, all day! Some things to do (activities and rides), concessions and private party spaces are all available at Papa’s for additional fees. 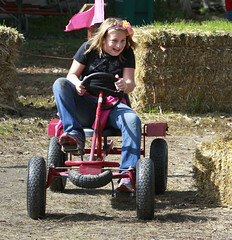 Click on the links to learn more about how you can have loads of fun at Papa’s and what you can expect for costs. FAMILY PASSES: If you know you’ll be spending more than one afternoon at Papa’s, consider a season pass. 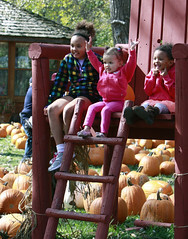 For $10/person in the immediate family, you can visit Papa’s as often as you want this fall. Just show us your family pass when you get to the admission gate, and we’ll welcome you with a smile! To purchase a family pass, visit our Square Store or ask one of our volunteers in the admissions or sales area.